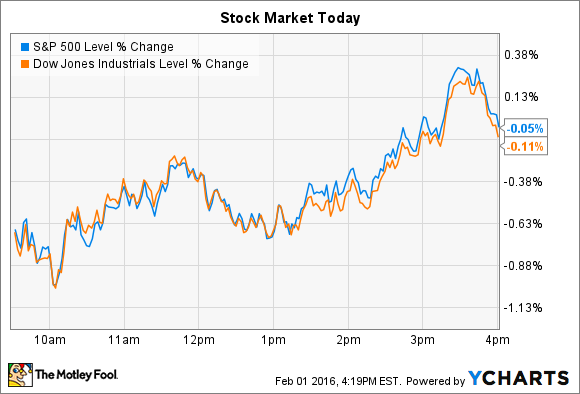 Indexes fell by as much as 1% at one point today before recovering to end unchanged. Stocks spent nearly all of the trading session in negative territory, touching a 1% loss before climbing back to end the day roughly where they started. The Dow Jones Industrial Average (DJINDICES:^DJI) lost 18 points, or 0.1% and the S&P 500 (SNPINDEX:^GSPC) shed just 1 point, for no change. Yet many individual stocks posted large price swings even as the broader market ran in place. Chipotle (NYSE:CMG) and DreamWorks Animation (NASDAQ:DWA) were among the largest movers today. Chipotle's shares rose 4%, to bring its recent rally up to a 16% gain since touching $400 per share last month. Today's pop came as the U.S. Centers for Disease and Prevention (CDC) officially closed its investigation into two E. coli outbreaks that were traced to a number of the restaurant chain's locations across a dozen states. "These two outbreaks appear to be over," the CDC said. The news comes at a good time for Chipotle, which will post its fourth-quarter earnings results on Tuesday, Feb. 2, and is expected to show its first-ever negative sales growth result. Consensus estimates forecast revenue sinking by 6% to $1 billion as comparable-store dive by roughly 15%. Earnings, meanwhile, should be sliced in half to $1.86 per share as profitability plunges. Investors will be keenly interested in management's comments about the most recent customer traffic trends. We know that comps plummeted to as low as -37% at one point in December when the food safety scare was making national news. However, through actions like ramped up stock buybacks and aggressive store expansion plans, executives have signaled their confidence that Chipotle will eventually return to its market-thumping sales growth and profit margin figures. We'll find out tomorrow just how long that rebound might take. DreamWorks fell 7% after its animated film Kung Fu Panda 3 pulled in $41 million at the box office over its debut weekend. That should be considered a solid showing for the company, after all, it was the best-ever January opening for an animated film, according to Box Office Mojo, and nearly beat 2014's Ride Along to become the all-time best theatrical launch for the month of January . In terms of DreamWorks' portfolio, though, Kung Fu Panda 3's release trailed its 2015 hit, Home. And, given the strength of the franchise, investors may have been hoping for the movie to open at something closer to How to Train Your Dragon 2, which pulled in $50 million in its debut on its way to almost $200 million of receipts. CEO Jeffrey Katzenberg warned shareholders not to get too excited about the Panda sequel, thanks to that soft January launch timing. "I do want to highlight that we have a non-traditional release window for an animated film in the U.S. market," he said in an earnings conference call. The good news is that family friendly competition is light over the next few weeks, and so Panda 3 could still bulk up its ticket sales to reach strong profitability. DreamWorks only other feature film release of the year, called Trolls, will occur in early November. It's a brand new property, which makes it a riskier bet than sequels from proven franchises like Kung Fu Panda and How to Train Your Dragon. On the other hand, the film has a solid opening spot heading to the holidays, and it boasts a strong voice cast led by Anna Kendrick and Justin Timberlake.